An Irish potato doughnut from Federal Donuts. Nuggets of Irish potato candy, the coconut and cream cheese confection that has long been a St. Patrick's Day staple for many in the Philadelphia region, usually start showing up on bakery shelves in March. For those who like the flavors of Irish potatoes but prefer a lighter, less dense texture, Federal Donuts has created a pastry that incorporates the tastes into a softer, more crumbly treat. The no-bake candy is traditionally made from butter, cream cheese, coconut, and sugar, then fashioned into ovals and rolled in cinnamon until it resembles small brown potatoes. 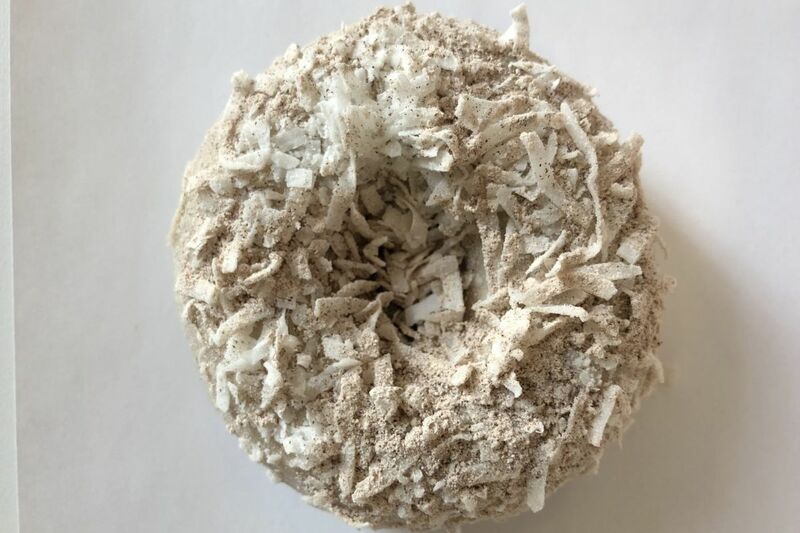 The doughnut tastes like cinnamon, but it also has a cream cheese glaze over the top that adds a smooth sweetness, as well as flakes of coconut to give it texture. The cake itself has the trademark FedNuts crispiness on the outside and is infused with warm spices that make it rich and mildly savory. Irish potato doughnuts, $2.75 at Federal Donuts, 1632 Sansom St.; 1219 S. Second St.; 701 N. Seventh St.; 3428 Sansom St.; federaldonuts.com.